NEW YORK (Mar. 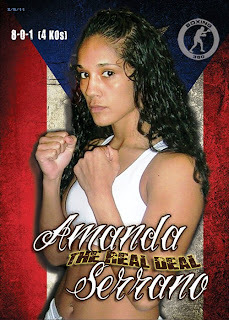 9, 2011) – Undefeated title challenger Amanda “The Real Deal” Serrano has signed an exclusive promotional with Boxing 360 and joined the New York-based company’s growing stable of future champions. The 23-year-old Serrano (8-0-1, 4 KOs), who was born in Puerto Rico, now fighting out of Brooklyn, is slick-boxing younger sister of former lightweight contender, Cindy Serrano. Amanda is presently rated No. 3 by independent source WBAN, as well as No. 7 by the WIBA. In her last bout in January, Serrano thoroughly dominated rugged Ela Nunez for a win by unanimous 6-round decision, avenging the only blemish on Amanda’s record, a draw versus Nunez in 2009. Other members of Boxing 360’s stable include USBA heavyweight champion Maurice “Sugar Moe” Harris, WBC #3 rated super bantamweight contender Leon “Hurry Up” Moore, former IBF super middleweight champion Alejandro “Naco” Berrio, NY State super middleweight title-holder Lennox “2 Sharpe” Allen, KO king Tyrone Brunson, Nick “Hands of Gold” Casal, Mike Mollo, Joshua “The Juice” Harris, Emad Ali, Angel “Toro” Hernandez and “King” David Estrada.